Recently, supporters of Big Sur Land Trust helped efforts to save elephants and other endangered species in Africa! Watch this video to see Glen Deven Ranch in action as a test site for Intel’s new AI technology developed in partnership with RESOLVE to help fight poaching in Africa. Glen Deven provided the perfect setting because many of the conditions there are like areas where these cameras will be deployed – rugged and remote without cell connectivity. Because Big Sur Land Trust’s supporters have cared for this beautiful conserved landscape, the ranch was able to serve this remarkable effort to save endangered wildlife in Africa. 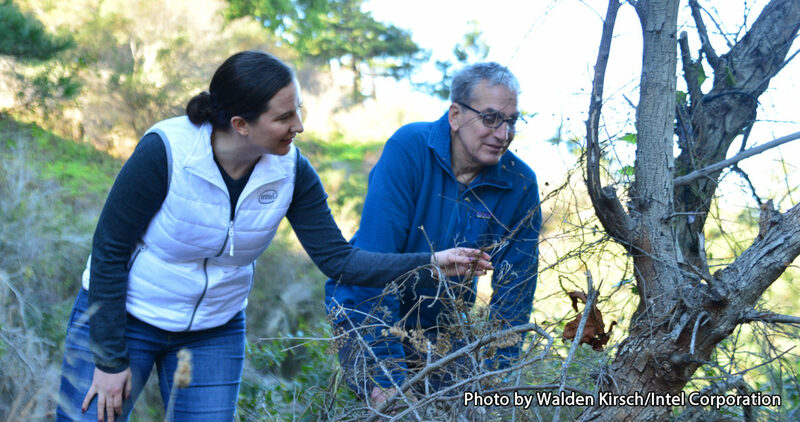 In the photo above, Anna Bethke, leader of Intel’s AI for Social Good team, and Eric Dinerstein, director of biodiversity and wildlife at RESOLVE hide a miniscule TrailGuard AI anti-poaching camera system near a trail at Glen Deven. And you can check out more of the story in the Monterey County Weekly!